By now you are probably aware of the situation regarding Scion. If you need a reminder, the Scion sub-brand has been discontinued, and with it all of its vehicles. But some of the brand’s most popular models were absorbed by Toyota and rebadged for the 2017 and 2018 model years. The Scion FR-S became the 2017 Toyota 86 while the Scion C-HR concept became the 2018 Toyota C-HR. The third and final model is the 2018 Toyota Corolla iM in Edmonton AB. The Corolla iM was first introduced for the 2017 model year, but it carries over into the new model year and will continue to turn heads with its sporty aesthetic and increased utility. The first hatchback version of the Corolla in many years, the Corolla iM delivers everything customers and enthusiasts have come to expect from the Toyota Corolla with the added bonus of a 5th door and increased cargo space. But let’s dive into what the vehicle has to offer a bit more specifically, starting first with that added versatility from being a hatchback. 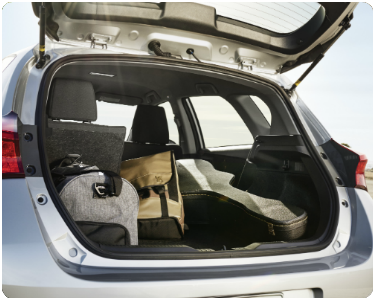 The Corolla iM offers 20.8 cubic feet of cargo capacity behind its back row of seats, which is 7.8 cu. ft. more than the traditional Corolla sedan. Add to that the 60/40 split-folding rear seats, and you’ve got plenty of versatile space to haul whatever you might need to bring along with you on the road. Now let’s hop into some of the convenience and technology features available in the Corolla iM. Features like power-adjustable, folding, heated mirrors that feature integrated turn signals and automatic LED lighting including headlamps, taillights and DRLs are features you might not often think about, but enhance the convenience of the Corolla iM quite a bit. Technologies like the 7” display audio touchscreen, dual-zone automatic climate control and backup camera are a little more obvious, but exciting nonetheless. The 2018 Toyota Corolla iM has plenty more to offer than the little bit of information we were able to depict here. If you’d like to learn more, don’t hesitate to browse through our blog or get in touch with us right here at Toyota on the Trail.